After a turbulent 2017, we’re all hoping for better things for the world of SEND this year. But however things pan out, 2018 should be a milestone year for one important reason – it’s supposed to mark the death of the old SEND system. The SEND reforms became law way back in 2014, but there’s been a lengthy process of transition and we’ve effectively had two SEND systems running in parallel since then. 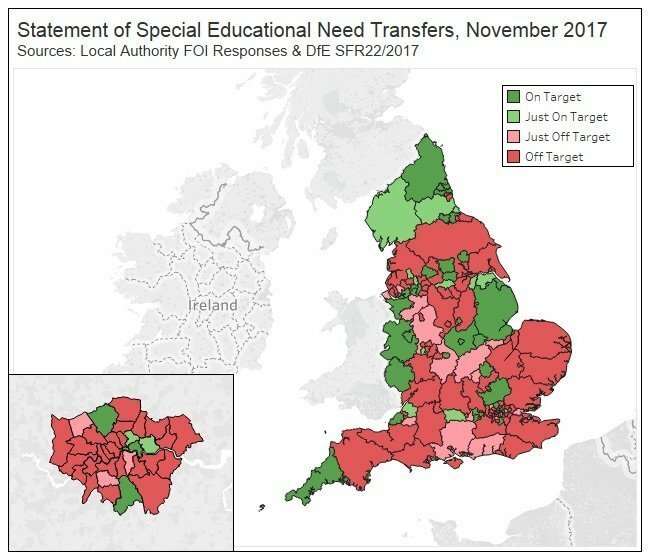 Most children and young people with SEND these days are on the new system of Education, Health and Care Plans, (EHCP) but there are still thousands of children out there whose provision is backed by statements of special educational need, the forerunner to the EHCP. Statements still come under the previous legal system of the 1996 Education Act, and the 2001 SEND Code of Practice. Local authorities (LAs) were given three years and seven months to transfer statements over to the new system, and there’s now only a few months to go before they’re supposed to finish the job. And thanks to a civil servant with a sense of humour, the transfer deadline is All Fools Day - 1st April 2018. When the SEND reforms were first implemented in 2014, there were around 237,000 children with statements of special educational need, according to data from the Department for Education (DfE). LAs were pretty slow to get going with the transfers and by mid-January 2017, there were still over 112,000 live statements on their books. Many LAs appeared to be running out of time, and the DfE noticed. So from 2017, they told LAs to update them monthly on their progress with statement transfers. As we enter the final few months, how are LAs doing now? As of November – with about 20 weeks to go until the 1st April 2018 deadline - LAs still had at least 47,000 children with statements of SEN to transfer over to the new system. Most LAs were working at a faster pace in 2017 than previously. But as things stand, unless LAs can go even faster, most of them will miss the 1st April deadline. At the pace they set in 2017, 92 of the 147 LAs that responded were off-target - and it’s very likely that four more LAs that didn’t respond will also be off-target too. Most LAs should get the job finished at some point later on in 2018 - but many are still a long way off course. And as of a few weeks ago, the worst performers were THREE entire YEARS off course. Check the map here for an interactive guide to how individual LAs are getting on: how many statements they have left to transfer, how fast they went in 2017, and how fast they need to go to get the job done by the 1st April deadline. How many children will be affected? How many kids does this affect? Well, unless LAs can go faster, on 1st April 2018 there could be as many as 21,000 children who won’t have been transferred over to the new SEND system – and who’ll still depend on statements to have their needs met, some potentially for years. So why does this matter? Firstly, this wasn’t supposed to happen, at least not on this scale, and the system isn’t set up for it. Statements of special educational need were supposed to be extinct as of 1st April 2018, replaced by bright, shiny, co-produced & child-centred EHCPs. So what legal and practical force will a statement actually have after that date? It’s really hard to tell. The DfE wrote to LAs in September 2017, making their expectations very clear – if LAs still have statements on their books after April, then they expect LAs to maintain the provision specified in the statement. And there’s statutory backing for what the DfE is saying, if you dig deep enough into the guts of the relevant legal text. “Councils are making good progress in implementing these new plans, and we are giving them more than £252m over four years to help them introduce the changes effectively. That’s good to know – but in practice, things aren’t going to be that straightforward. “Maintaining provision” isn’t the same thing as having a real live statement, and it’s certainly not the same thing as having a real live EHCP. Basically, it’s a zombie statement. And once you look at some of the practical problems of handling tens of thousands of zombie statements over a period of months and years, there are going to be some big, big grey areas. 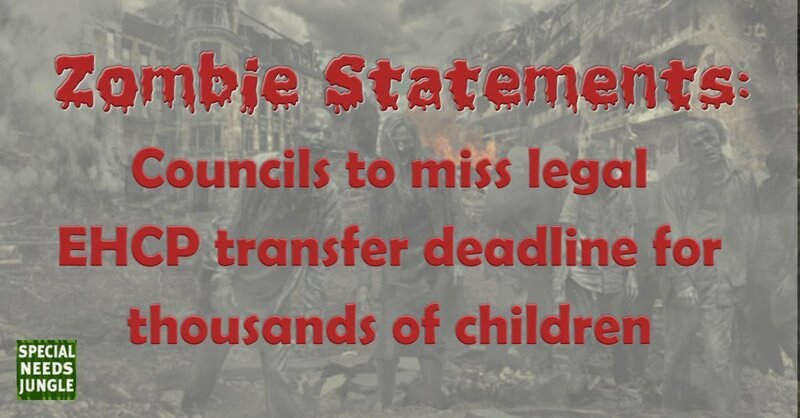 Zombie statements might be protected in theory, but it’ll be in limbo - right when LAs and schools alike are reporting huge problems with funding. The concern isn’t so much about that provision will be whipped away from statemented kids within hours of the deadline passing – that’s not likely to happen across the board. It’s more about the quality, quantity and appropriateness of existing provision for these children being leached away over months and years - when an EHCP is supposed to offer so much more. So we’re staring down the barrel of about 21,000 kids who’ll still have statements when April comes. There are about 10 weeks left. Can LAs work faster to convert these over to the new system? Well, many of them can work faster and many undoubtedly will. There’s a fair chance that some of the LAs who are off-target now will clear the backlog by April if they pick up their pace. But the process and the end product will not be pretty - and in many cases, it probably won’t be lawful, or even fit for purpose. Most of the time, children who have statements of special educational need will go through the transfer process and emerge with an EHCP. The DfE has said – time and again – that no child should lose any provision simply because they are moving from the old SEND system to the new one. And the DfE has said – time and again – that EHCPs are an improvement over statements. But that’s not how things are panning out, even now. If you talk to parents in the process, and people who are helping them navigate it, the quality of the transfer reviews - and the EHCPs that emerge from it - is mostly dreadful. There is very clear statutory guidance in place laying out how statement transfers are supposed to work. I’ve got involved in around 50 transfer cases in the last year alone, including my own two kids’ cases. None of these cases – not a single one – has followed this guidance properly. And I have yet to see a draft EHCP that’s better than the statement that preceded it. LAs are already cutting corners to meet the statement transfer deadlines. Some aren’t bothering to tell parents that they’ve started the transfer. Many aren’t bothering with fresh professional assessments. Many aren’t integrating health & social care input, which is one of the main things that is supposed to make EHCPs better than statements. Many are simply copying and pasting wording from statements – some of which hasn’t been updated for years anyway. And in the worst cases, they are cutting and pasting selectively from statements, with specified and quantified provision not making the cut. So are there any more corners left to cut? Amazingly, there are. Many LAs have already outsourced EHCP writing to private firms. LA spending on EHCP outsourcing shot up by 30% in the last financial year. Outsourcing isn’t necessarily a recipe for trouble, although a lot depends on the culture of the LA that’s commissioning the work. But there’s a new game in town. As the transfer deadline looms, LAs are bringing in temps on very short-term contracts to pump and dump converted EHCPs into the system before the deadline. “This is a desktop exercise, and there is no requirement to contact the LA, or families, or young people” [East Midlands, December 2017] – remember, this is supposed to be a person-centred process! “You will be required to draft statements, [and] notes in lieu” [West Midlands, January 2018] – these are for the old SEND system, why are they needed now? These are vacancies for work lasting no more than a few months, and many of the daily and hourly rates are nothing for a professional to get out of bed for – the worst EHCP writer wage I’ve seen in recent weeks was £12 per hour. It is very, very hard to imagine that lawful, person-centred EHCPs are going to come out of the end of this frenetic and disposable business model. And LAs also have another option in their toolbox for dispensing with statement caseload. At the end of the transfer process, they might simply decide that there’s no need for an EHCP, and cease to maintain the statement. Thus far, (with a small number of dishonourable exceptions) most LAs have not taken this route. But as pressure builds to meet the deadline, the worst LAs will be tempted increasingly to venture down this path. This is affecting tens of thousands of parents whose kids still have statements, including mine – and as ever, we need to be more than just watchful. The first thing you should do is read this excellent guide, written by solicitor & SNJ columnist Hayley Mason a few weeks ago. The next thing you should do is go to SNJ’s EHCP Transfer Clinic, and ask questions there if you need to. Has your LA told you that they have begun the transfer review process? Has your LA carried out a fresh EHC needs assessment and sought professional advice? If they haven’t, are you happy with this? They have to get your permission to dispense with it. Has your LA asked you for your child’s views and your views, and have they held a Transfer Review meeting? If not, ask them why not – they have to do this. Has your LA sought and obtained health and social care input to inform the new EHCP? If not, have they explained why not? If not, ask them why not – they have to do this. If you’ve fed independent professional reports into the transfer process, has the LA reviewed them and incorporated the advice? If not, ask them why not. Has your LA told you whether they will be converting the statement into an EHCP? And if they have decided not to, have they explained the legal justification for ceasing to maintain the statement? Does the content of the draft EHCP itself comply with the law? If not, get advice if you need it, and go back to them with amendments. Spare a thought for the front-line SEN team case officers. They will be working under immense pressure over the next few weeks, and they’re working for management who are probably failing them as well as failing your family. Be polite, be civil, but escalate problems quickly when the case officer can’t sort things out. And finally, as things creep closer to 1st April, some LAs are likely to try to finalise the EHCP before issuing a draft plan - just so they can say they’ve met the deadline. If this happens (and it happened to me, as did almost everything else on the list above), then politely, but firmly insist that the LA move the document back into draft phase, to restore your lawful right to review, check, and request changes make representations about its content. Many of us are going to face an unpleasant set of choices here. These aren’t free choices. None of them is palatable. None of them should be acceptable in any properly-running system, let alone one which has had already had over £250 million of government money pumped into it purely to grease its wheels. None of them should be acceptable to any accountability regime with a functioning cerebral cortex and pulse. But that’s where many of us are - worse off, despite everything that the new SEND system promised. 2018 is supposed to be the end of the beginning for the SEND reforms. But the old system’s not going out with a bang, and it’s not going out with a whimper. It’s going out to the tinny, farcical, off-key sound of the Benny Hill theme tune, and it’s not funny in the slightest. SEND on the rocks: Can a new minister rescue the reforms from certain disaster? Prediction – they can then ask for more money for administration, which will not be ring fenced, so they can siphon it off elsewhere, but probably not children services. As more administration costs is the answer to the question…. You made it onto BBC Breakfast Tv this am with your solid stats and facts! Thanks Penny, we collaborated with them, allowing them to use our FOI information in an exclusive arrangement. Hi I am both appalled by what I have read but then not surprised on another level. I am a parent of 4 children one of whom is special needs. My problem is even after 17years of his life and the fact I am a qualified teacher who has for the past 5 years worked as a SEN TA he has no formal diagnosis. I have tried whatever I could to keep him in mainstream. To obtain for him the support he requires and deserves.He has been thru 2 ” outstanding ” schools but despite being told he was an A* maths student ( due to a natural mathematical ability certainly not due to intensive study) he has left school at 16 with no qualifications. He is onto his 3rd job and is 18 in August. I want the very best for my boy and at this stage of the game I know he is going to struggle immensely in the future. He has been let down by every educational establishment he has encountered. Both himself and I have NEVER had the support or been given the information needed to help ourselves. Which in my experience and the experience of those around is the only option it would appear because if you dont fight for it yourself on behalf of your children it aint happening!! Where do I go from here? How & where do I go to get the support & advise I need to support my son into adulthood and give him the future I dream of for him? ?The future he deserves.